In the 3rd Qtr, 5th grade students continue to develop two hand homerow typing proficiency. 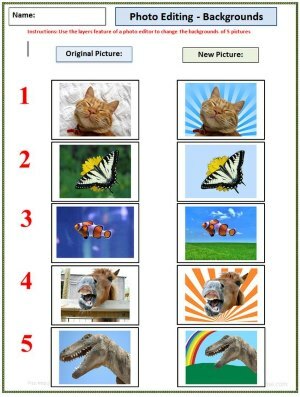 Students will use a photo editor to crop, adjust brightness and contrast, remove red eye, and resize photos. 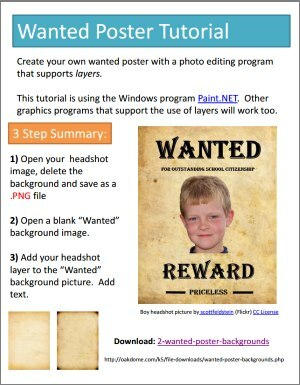 Students will learn to remove picture backgrounds and use layers to combine photos to make a wanted poster, cartoon a face, create Andy Warhol pop art and more. 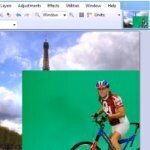 Students can use these skills and techniques to improve the photos used in their technology integrated assignments with Powerpoint, slideshows, brochures, posters, movies, websites, etc. These assignments also build strong file managment skills. Students will open, save, name and rename files, as well as create and name folders throughout these weekly projects. 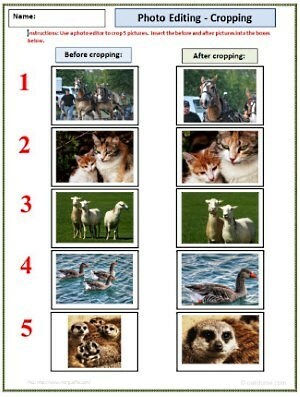 1) Photo Editing - Cropping - Learn to crop images. 2) Photo Editing - Red Eye - Practice removing redeye. 3) Photo Editing - Brightness / Contrast - Adjust dark images. 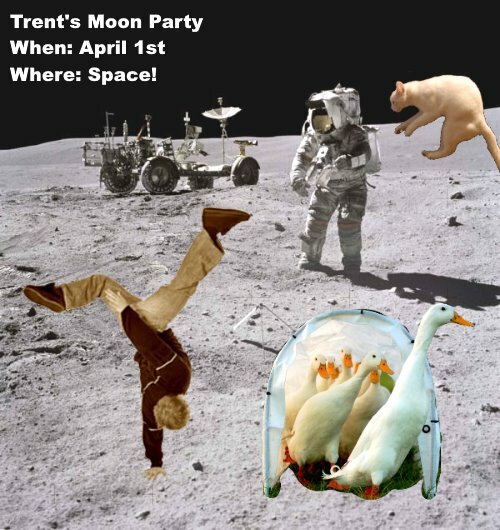 4) Photo Editing - Layers - Moon Party - Learn to use layers to combine images. 5) Photo Editing - Layers - Funny Photos -Remove backgrounds and combine images using layers to make funny photos. 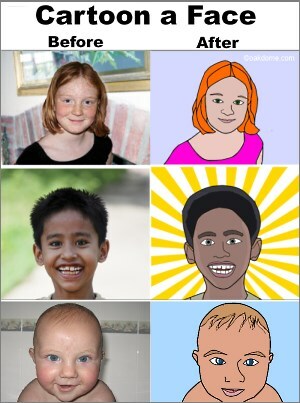 6) Cartoon a Face - Learn to draw cartoon faces using many tools and skills. 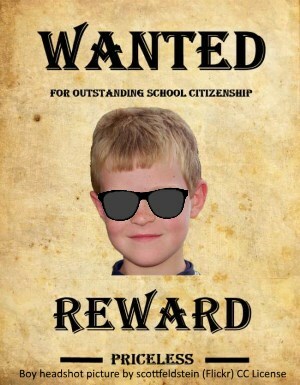 7) Wanted Poster - Put your face on a wanted poster (Easy!). 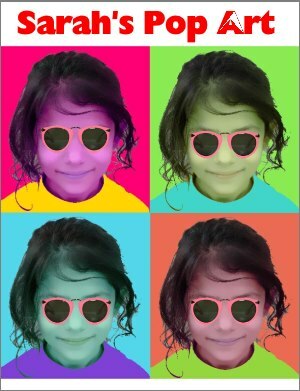 8) Andy Warhol - Re-create the classic Andy Warhol pop-art style with your picture. 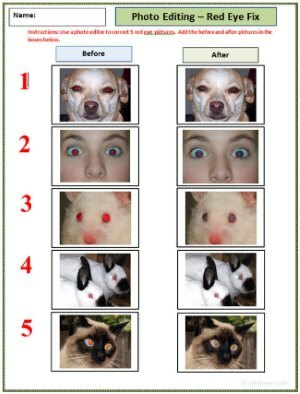 Students will learn to use the red eye correction tool of a typical photo editing program. 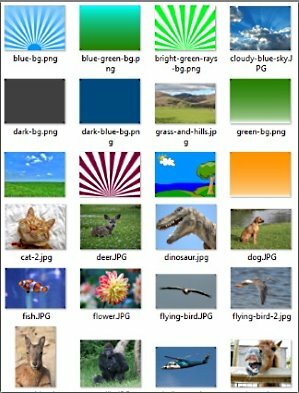 Students will also practice managing and renaming the files with descriptive names as well as inserting them into the "Photo Editing Red Eye Fix" template. 3) As best possible, remove the red eye for each picture. 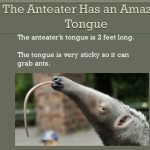 1) Download the Funny Photo Layers images. 2) Choose 5 photos to edit. Delete their backgrounds. 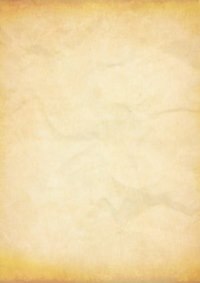 3) Give each photo a new funny or interesting background. 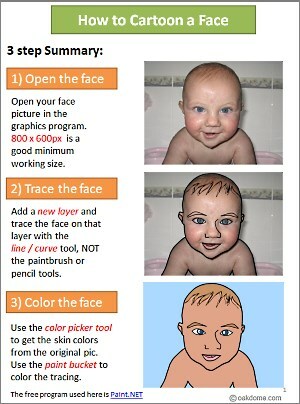 Download: 3 cartoon-a-face-practice-pics.zip (girl, boy, baby). 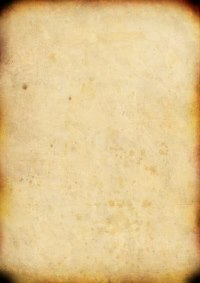 8) Save your work, then insert the finished graphic into a word processor and print. Students use a stick figure animator to create a "floating" stick figure. No installation needed. Just download, unzip the file, then click pivot.exe to run it.